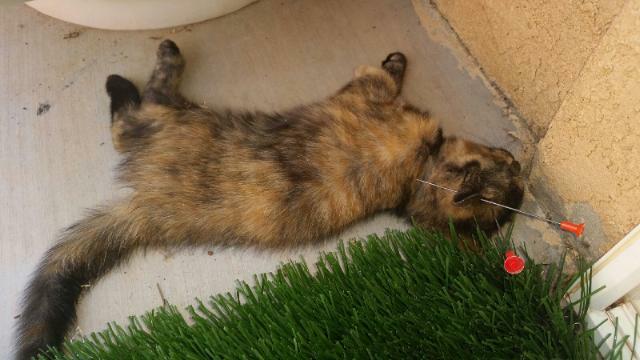 ST. GEORGE — A juvenile was arrested and charged with animal cruelty after a cat was found Friday morning with two blow darts pierced through its skull in the backyard of a St. George home. Around 9 a.m. St. George resident Lee Webb’s chihuahua was standing in front of the doggy door that exits into the backyard when he began barking wildly. Just outside his back door a kitten lay dead with two 6-inch darts – sharpened spikes made of steel with plastic ends – protruding from its head. At first he thought the cat was fake, but then he touched the cat and found it to still be warm. Previous to this incident Webb found additional darts laying in his backyard which he had suspected were aimed at his dog, but his dog has never been hit. Animal control and St. George Police investigated this incident and questioned people in the area. Upon talking with a 16-year-old, police found probable cause and arrested the young man for animal cruelty charges, St. George Police Sgt. Sam Despain said. Juveniles arrested or charged are presumed innocent until the matter is adjudicated or otherwise resolved. I’d like to aim some blow darts at his stupid head!!! … is wrong with these people?? What neighborhood did this take place??? Well, here we go again…. I wonder if the lenient treatment of the juvenile who shot Quiver, the cat, with a arrow in the head helped this happen. No real punishment means someone else thinks it will be OK to do again. And I wonder how his parents allowed him to have a blow dart gun? What did they think he would use it for, paper target practice? About time to start punishing the parents too. Parents, look through your child’s room and see if there is anything in there that will harm an animal. Take it away, you have that right as long as they are under your ‘supervision’. When did they start taking this seriously ? We have had two cats shot in the last few years one in the face with a BB. The other a thru and thru shot in the back just missing its spine. We have the vet bill and xray stating the cat was shot. My point is we called the SGPD for both incidents , but both times we were told the St George police does not investigate crimes against animals. And the officers left with out so much as making a report. Just when did they start taking these crimes serious? cops in st George are lazy to do anything that’s too much paper work. This may be a sign of a personality disorder in this kid. Antisocial personality disorder. Supposedly incurable, but treatable. My “treatment” would be … Until he finally gets the message. Char,If he was arrested for animal cruelty,how is that no real punishment? Being arrested IS NOT a punishment. If and when he is convicted of this horrendous crime, his sentencing will be the punishment. I’ll bet he is out of jail and with his “loving” parents by now. And as was evidenced by the kid who shot the cat (Quiver) through the head not too long ago, this kid will probably just get the same wrist slap and told to be a good boy and be on his merry way. Kids will continue to do these evil acts on animals UNTIL they are sentenced to do actual time in a detention facility…..and that’s a big maybe. Wait till some kid decides to go out to someplace like Diamond Valley or Winchester Hills and take a shot with a firearm at someone’s horses. Then you “might” see some sort of real punishment. First cats…. Next humans. Keep this kid locked up! Awwwww, it’s okay. He is just a kid with a blow gun. And apparently has parents who don’t give a rat’s behind what their little freak is up to. It’s time PARENTS take responsiblility for their children’s mentally disturbing actions. There is a lot a cat hate in St. George and I don’t think it’s just the kids. I bet this young man’s parents have complained about cats in their neighborhood so the boy felt justified. Maybe there is a problem with feral cats but arrow, BB gun and now dart shootings? There’s a better way to handle the problem. How can anyone be brought up with so little respect for life? Wondering if this 16 year old was one of them “illegals” or of the “white and delightful” genre. If of the former, then you probably should expect the fullest prosecution. If of the second group, release him with no charges and send him on a mission. Isn’t that how it works here? Where do these freaks get their values from?